The American chestnut (Castanea dentata) was one of the largest growing forest trees in eastern North America. It was important for timber as well as nuts for human use as well as wildlife. A deadly fungus disease, (Cryphonectria parasitica), was introduced from the Orient that effectively wiped out this chestnut in the first half of the 20th century. Efforts are currently being made at Meadowview in Virginia by the American Chestnut Foundation to "bring the American chestnut back" as a forest tree again through a backcross breeding technique using a highly fungus resistant Chinese chestnut as a source of resistance genes. After the first cross with an American chestnut is made, the progeny are screened to recover the trees that have the resistance genes. These trees are then back crossed to another American chestnut and the offspring are screened again. This process is repeated several times to "wash out" most of the Chinese chestnut genes, leaving a nearly pure American chestnut with the fungus resistance genes in place. When two of these trees with the resistance genes are subsequently crossed with each other, 100% of the offspring will inherit the resistance genes and the trees can be reintroduced to the forests. A similar backcross breeding project is being conducted by Dr. Dragan Galic from the University of Guelph at Simcoe Station for the Canadian Chestnut Council. Surviving Canadian American chestnut trees were crossed with American x Chinese hybrids borrowed from earlier work done at the Connecticut Experimental Station. Land was donated to grow out the hand crosses at the Tim Horton's Children Foundation camp in St. George, Ontario. This work is on-going. The Chinese chestnut cannot be used as a reforestation tree simply because it does not reach the height of the American native and would never be able to dominate the forest. It is hoped that this backcross tree will have the height requirement necessary. This long term project is past the half way point, with a few years to go in its program. A further effort to bring back the American chestnut is at Syracuse University in NY. This involves a genetic engineering technique. Pure American chestnut trees grown in tissue culture were "hit" with a packet of genes that provided a very high level of fungal resistance to the trees. This project has broken new ground in a number of research areas. The project has reached the point where government approval for distribution of the genetically modified trees is near reality. Chinese (C. mollissima), Japanese (C. crenata) and the less resistant European chestnut (C. sativa) trees have since been introduced into Canada and the United States to take the place of the orchard type American chestnut trees. They were only partially successful as they often lacked the hardiness of the American cousin. As time went by, hybrids were developed with American, European, Japanese and Chinese chestnut trees. Hardier orchard trees were developed with a fairly good degree of resistance to the chestnut blight fungus. These complex hybrids along with pure Chinese chestnuts are the trees that are currently being used by growers in Ontario with Chinese chestnut trees the dominate choice. Incompatibility is an issue with grafted chestnut trees. The rootstock and top needs to be carefully aligned, and the best rootstocks seem to be the seedlings of the parent being grafted. Graft failure can occur years later for no apparent reason. Because of this compatibility issue, seedling trees from good blight resistant parents work the best. Poor seedling trees can later be grafted to the best producers in the orchard. Double planting and the removal of poor trees at crowding is another viable option. Some work has been done to produce chestnut clones from cuttings but only a few of the cultivars have the vigour of the parent, so producing trees from cuttings is limited. Tissue culture technique is the best way to reproduce clonal chestnut cultivars on their own roots. However, Europe is the only place where tissue cultured chestnut is being produced and they have only been reproducing European cultivars. These trees would be suited for zone 6-8 in Ontario, but for now they are not available. Hopefully, a lab will take up the challenge of tissue culturing our best chestnut cultivars for Ontario. So far, our best Commercial chestnut orchards for Ontario are Chinese chestnut seedlings from hardy, blight resistant parents that are selected for large nut size. They are suited to the mild areas of zone 6 to 7 (close to Lakes Erie and Ontario) in Southwestern Ontario and the Niagara Peninsula. They are best grown on well drained sandy and light clay loams with a pH of 5 to 6. Generally, the peach soils are well suited to commercial chestnut orchards. Irrigation is important in August and September to help in the sizing and filling of the nuts. On average, chestnuts can produce 1-3 tons per acre. Nut Size Large size nuts (diameter greater than 1.1 inches) are sold for a premium. Seedling trees or cultivars that regularly produces 80% or more large size nuts is the most desirable for the fresh market trade. Production Trees must produce annual crops of nuts with reasonable cropping from year to year. A tree that produces too many nuts that can't size up to premium size is no better than a tree that bears light crops alternate years. Ripening Time Chestnuts that ripen early (mid September to early October) are more desirable. They reach the market first, ahead of the imports and command the premium price. They also avoid the chance of injury from early fall freezes that could destroy the crop. Blight Resistance Though Chinese and Japanese chestnuts are our most blight resistant orchard trees; they sometimes lack nut size, vigor, form, early bearing and hardiness. The American x Chinese hybrids often overcome the hardiness problem, but they lose some of the blight resistance. Under these circumstances, the blight may be managed by mud-packing, pruning and using hypovirulent blight strains (blight that has an introduced virus). Many selections have been made over the years. The cultivars listed here are among the best for Ontario. Gideon - This is a seedling selection from the Empire Chestnut Co. in Ohio. The tree is vigorous and productive. The nuts are sweet, large, mid-season ripening and the pellicle peels easily. It is highly resistant to chestnut blight. It is a good pollinizer suitable for zone 6-8. 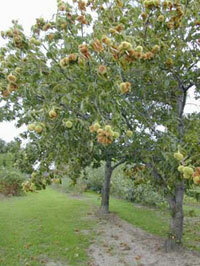 Benton Harbor - This Chinese chestnut cultivar has been selected in Michigan. The nuts are sweet, large, ripening mid-season and the pellicle peels readily. It is highly resistant to chestnut blight and is a good pollinizer suitable for zone 6-8. Peach - This Chinese chestnut was introduced by the Empire Chestnut Co. in Ohio. The tree is vigorous, productive and a suitable pollinizer suitable for zone 6-8. The nuts are large, sweet and mid-season ripening. Lockwood - 'Lockwood' is a complex hybrid cross of American x Japanese background. It was selected at the Connecticut Experimental Station. The tree has fairly good blight resistance and is very productive. It is hardy for zone 6-8 in Ontario. The nuts are exceptionally large taking after the Japanese parent for nut size, attractive and sweet. The nuts ripen after the middle of October. Bouche de Bertizac - This European x Japanese hybrid was selected in France for commercial production of large chestnuts. The tree is an annual, extremely productive cultivar. The nuts are typical of the quality found in the stores from Europe. The nuts ripen after the middle of October. Grimo 150Y - 'This tree is from the Grimo Nut Nursery and is an open pollinized seedling of a Manchurian chestnut planted by Earl Douglass from Red Creek, NY. 150Y is moderately blight resistant. The tree form resembles the Manchurian parent and is moderately productive. The nuts are large, sweet and attractive. Chestnut trees are self-infertile. That means that they must have another chestnut tree nearby with viable pollen to produce nuts. For commercial plantings a planting plan like the one shown on the following page will help growers to establish trees with permanent pollinators in place. If all seedlings are used then a careful distribution of varieties is not necessary. It is advisable to consider field drainage tiles between the rows and irrigation for prolonged dry spells of 6 weeks or more during the growing season. Tile lines are important in most chestnut orchards for two reasons. First, excess water is removed in the spring from the land removing stagnating water around the roots and secondly, the land is accessible for orchard equipment work much earlier after rains. A small amount of annual pruning of low limbs, those that interfere with orchard management and the limbs that form narrow crotch angles should be removed. Staking young trees may be necessary to maintain straight upright form. As trees mature, some that tend to overbear will produce smaller and so less desirable nuts. Heavier pruning on these trees will balance the root system with the top, allowing for larger nut size. 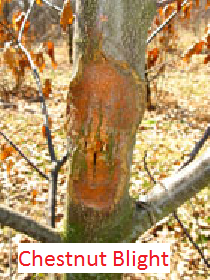 South-west injury caused by the reflection of sunlight and heat from the snow on the bare trunk of chestnut trees on above freezing days in March can heat the trunk sufficiently to cause sap to flow up the tree. As evening falls and temperatures go down below freezing, the sap in the trunk that has not made it back down to the safety of the roots, freezes, expands and splits the trunk. A coating of white latex paint up to the lowest branches can prevent this sap flow by reflecting the sunlight. A car wash mitt dipped in the paint can quickly be used to apply the paint, rather than using a brush. 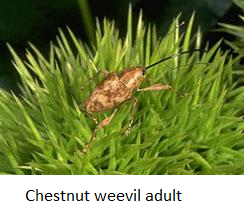 Chestnut pests including the Asian chestnut gall wasp (Dryocosumus kuriphilus yasumatsu) and the two chestnut weevil species, the chestnut "lesser' and "greater" weevil will need action for control. The chestnut gall wasp was introduced into the USA from China illegally on grafting wood. The pest is now found in Ontario. There are natural parasitoids and one introduced from China that attack this pest and in time will reduce the damage.